Play assistant Stacey and husband Nick, from Edinburgh, began to realise something wasn’t right when Tamzin developed a series of marks on her body at a few months old. “Some of them were tiny, like little freckles, others were a bit bigger, around the size of a 50p piece,” said Stacey. “But they weren’t there when she was born. “We assumed they were just birth marks, but when Tamzin was about six months old a health visitor spotted them and thought it might be something else. 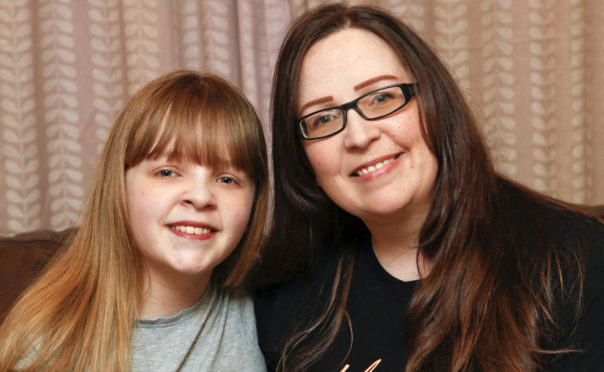 Doctors said Tamzin, now 13, had Neurofibromatosis (NF), a genetic condition that causes tumours to form on nerve tissue. “We were told there was a risk of tumours, they could be benign or they could be malignant and could come anywhere on her body, including her brain and spine. “It was all ‘ifs’, ‘buts’ and ‘maybes’ – and it was terrifying. “It took me a long time to come to terms with the news. The stress was so much that it put Stacey and Nick off having any more children. “I always wanted to have lots of children but given the experience, it was just too much for us,” Stacey said. Tamzin’s condition affects her mobility, learning and can result in physical and mental exhaustion. And it has resulted in several hospital visits over the years. “Tamzin has been treated in the sick kids wards and in A&E – and has been well looked after every time,” said Stacey. “We experienced firsthand the good work of the hospital charity, from the books and DVDs on the ward to the play specialists and volunteers who provide arts and crafts for the children, there are so many distractions. Stacey has taken part in lots of fundraising events for Edinburgh Children’s Hospital Charity, even abseiling down the Forth Bridge. Now, with just a few months left until the launch of the Oor Wullie Big Bucket Trail, keen artist Stacey is lending her skills to that too. She’s designing one of the 150 sculptures which will be on display from June to September across the country, forming Scotland’s first ever national art trail. At the end of the 11-week event, the statues will be auctioned off to raise funds for Glasgow Children’s Hospital Charity, Edinburgh Children’s Hospital Charity and The ARCHIE Foundation, the charities supporting nearly half a million sick children every year. Stacey will design a sculpture sponsored by Velux – but she’s staying tight-lipped about how it will look. “It’s going to be a surprise,” she said.